Food, Music and Charity fans, I have a brand new event for you Eats & Beats. The inaugural event takes place on February 22, 2014 and benefits the DJ Irie Foundation which seeks to improve the lives of South Florida youth. They generously offered my followers a $20.00 discount on tickets by using promo code CHOWFATHER. See you there! Imagine a perfect showcase of local culinary artistry paired with premium wines and spirits, minus the velvet rope. 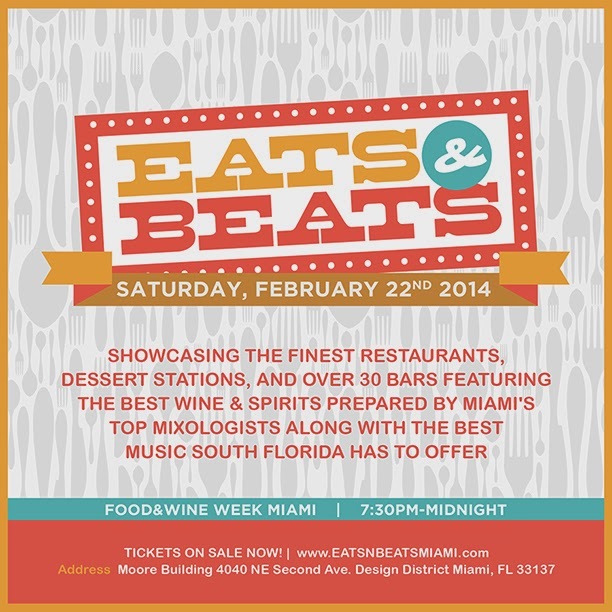 Comprised of some of the most renowned restaurants in South Florida, to some of the most mouthwatering dessert artists, Eats N Beats will satisfy the local food enthusiast as well as the sophisticated “foodie” expecting to delight in some of the best dishes and libations our city has to offer. Not to worry, keeping true to our City known for beauty and some flash, the event will touch on all of the senses. Complete with dynamic production, local VIPS and Celebs Eats N Beats will also be outfitted with the comforts one has come to expect from an event in Miami. The showcase will attract those looking for an alternative type of food event, one that brings the best of three worlds: food, music and wines/spirits together seamlessly. This new addition to the culinary scene in Miami will pair an array of our most frequented and popular eateries with local music, by some of the most celebrated talent to hit our local stages. As opposed to creating separate events, this inaugural fete was designed to create a progressive experience for attendees. Guests will enjoy four floors of palate-pleasing food, sweets and delicious cocktails while dancing to the beats of live music curated by DJ Irie. The world renowned has hand selected an impressive and diverse ensemble of bands and DJ’s while slated to hit the booth for a DJ spot himself. Eats N Beats will benefit the Irie Foundation, a 501c3 non-profit organization based in South Florida with a mission to aid youth and improve graduation rate. This new event is a very personal invitation for locals by locals to come out, ready to eat and ready to dance, as Eats N Beats will hit the pulse of Miamians and visiting guests with only our best, -Miami’s best. -Separate Door for Prompt Entry and Re-entry.